FOX Racing had the most liked content! FOX Racing replied to Bustaboxi's topic in Vespa PX, T5, Cosa etc. Welcher NewLine ist das denn? Verkaufe: Li, DL Teile z.B. Polrad, Kurbewelle etc. Sind die Forklinks nicht für Scheibenbremse ?? FOX Racing replied to Basti_MRP's topic in Vespa PX, T5, Cosa etc. Gibts die nur in 40 & 28 mm? Welche AW haben die? FOX Racing replied to poppa's topic in Lambretta LI, GP, SX, TV etc. FOX Racing replied to stephan_rlp's topic in Vespa PX, T5, Cosa etc. PM40 in Edelstahl? Original oder Nachbau VSP inox / Fake? 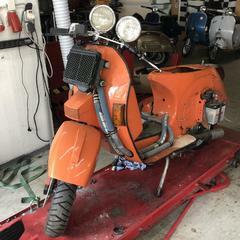 FOX Racing replied to ger51350's topic in Vespa V50, Primavera, ET3, PK, ETS etc. FOX Racing replied to Han.F's topic in Vespa PX, T5, Cosa etc.